I know it’s been a few weeks since I posted but life just got in the way. I have missed you all and I hope you are all well. 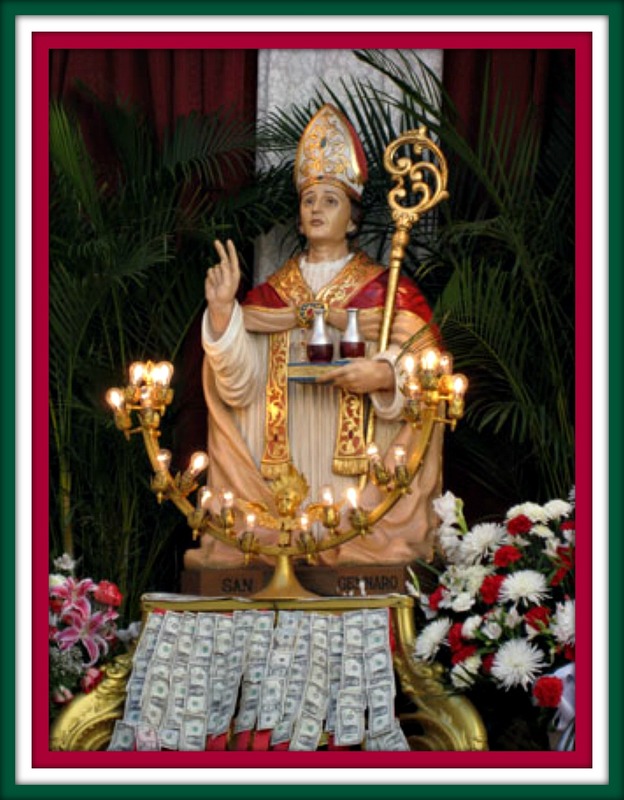 Today, (September 19th) is the Feast of San Gennaro. 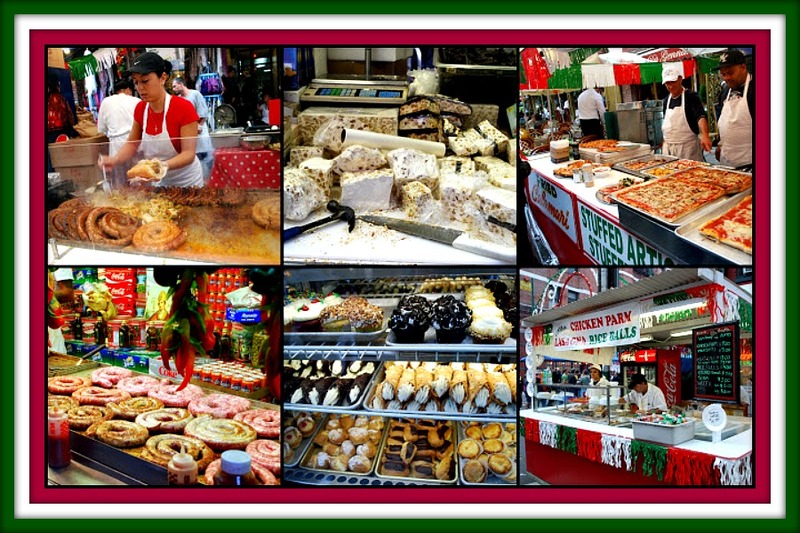 The beloved Feast of San Gennaro is an annual celebration of the Patron Saint of Naples. 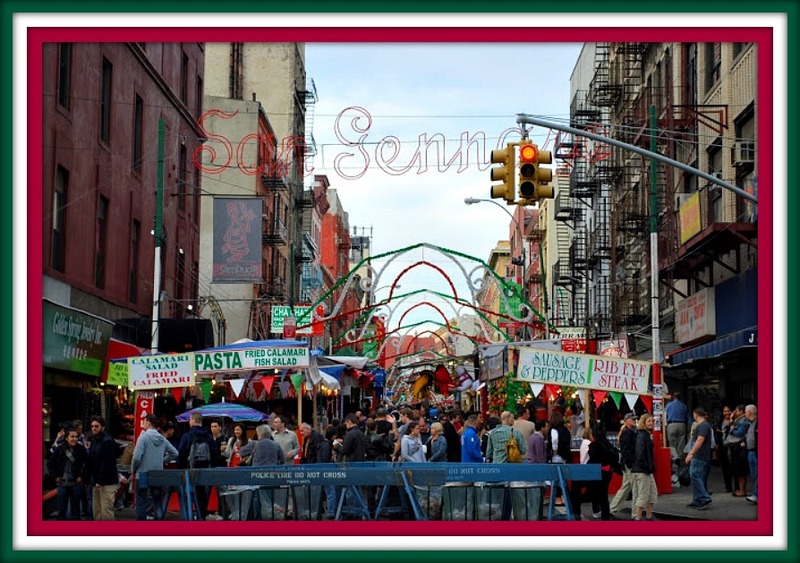 The first Feast in NY took place on September 19, 1926 when newly arrived immigrants from Naples settled along Mulberry Street in the Little Italy section of New York City and decided to continue the tradition they had followed in Italy to celebrate the day in 305 A.D. when Saint Gennaro was martyred for the faith. 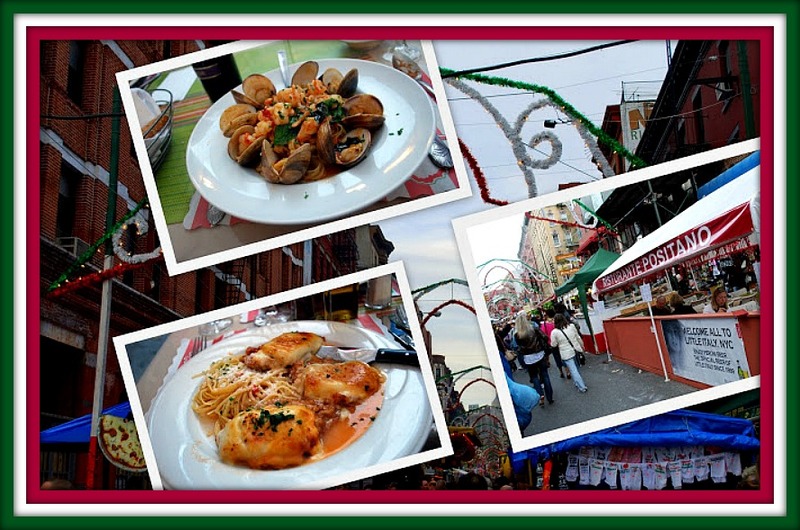 Since then the Feast has grown and is now New York City’s biggest, most famous and longest running religious festival and takes place in Little Italy each year for 11 days. 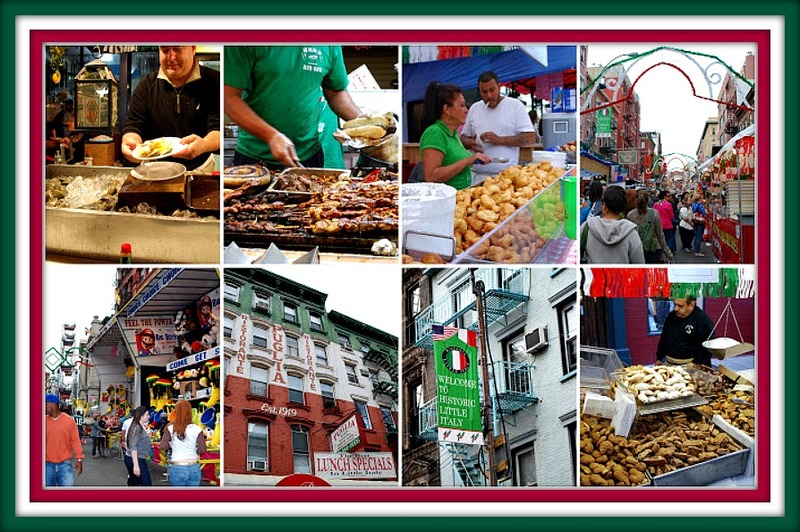 The streets of Little Italy are lined with food vendors, carnival games, stages and patio dining throughout the Feast of San Gennaro. I will share with you, two of my recipes for “Feast Food” at the end of the post. 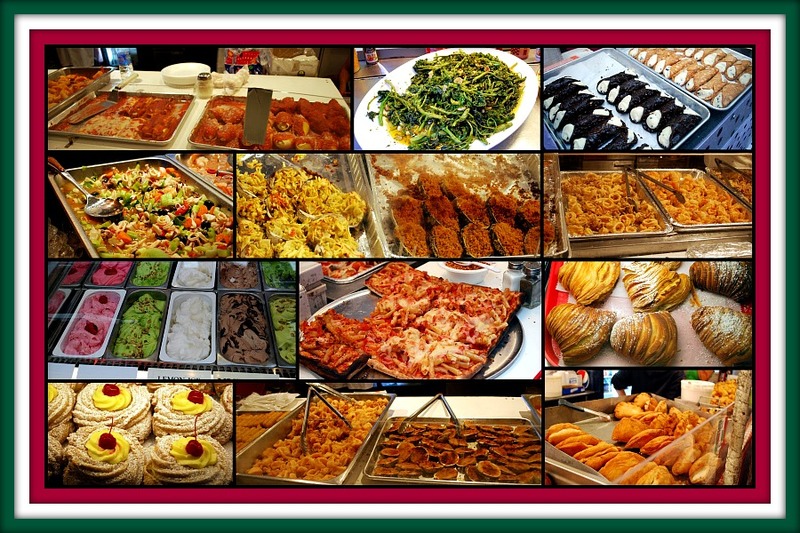 The food vendors during the Feast serve a variety of traditional Italian foods– sausage and peppers, zeppoles, calzone, gelato, tiramisu, torrone, broccoli rabe, stuffed artichokes, grilled eggplant, fried calamari, pork braciole, and my favorite, “rice balls”. For dessert, mostaccioli riepeni (Italian chocolate cookies with fruit and nuts inside), Italian pastries such as cannoli, sfogliatelle, pignoli cookies, baci kisses and biscotti and let’s not forget the espresso, cappuccino and of course wine. 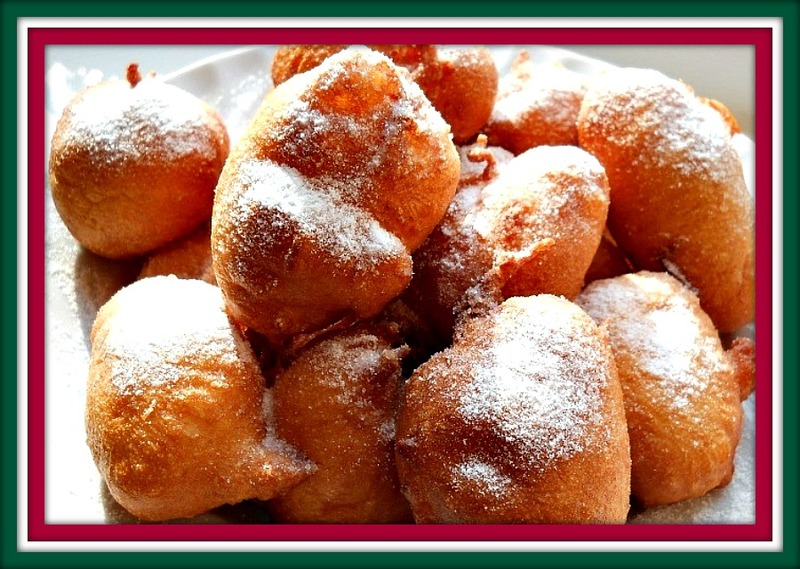 Zeppoles are one of the most popular foods at the Feast and with good reason- who doesn’t love fried dough dusted with powdered sugar? Torrone is also quite popular- what more can I say? 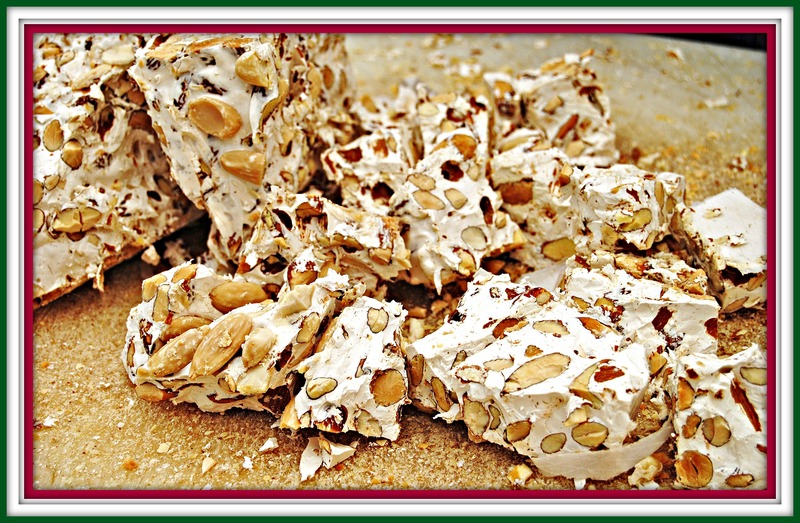 An Italian candy made from honey, sugar, toasted almonds, and egg whites- delicious. My recipes for today are two that I have previously posted but I wanted to put them together on this post as an easy reference for you, if you want to make “Feast food” for your family and friends. They are sausage & peppers and rice balls. Since my last post about rice balls, when I introduced my beloved rice ball maker in the traditional round shape; I have since purchased another rice ball maker in a cone shape. My mother made the cone shaped with sauteed broccoli rabe as a filling and the round was always traditional rice, meat, peas and mozzarella. I got a little daring and made shrimp, peas, chorizo sausage and mozzarella for the cone shaped. If you would like to see step by step instructions with photos, just look at my original post from December 13, 2015 by typing “rice balls” in the search box and it will take you directly to the post. Heat 6 cups of chicken broth in a sauce pot- (If using saffron add it to the broth now). Add the rice and stir until evenly coated. Toast for a few minutes. Once the broth has been absorbed, continue to add a ladle at at time of broth, stirring occasionally. Remove the pot from the heat and add 1 tbsp butter and the grated cheese and mix well. Pour the rice onto a baking sheet and place in the refrigerator for 2 hours to cool. The rice should be able to form into a ball once cooled properly. Once the beef is added, with a wooden spoon, break down any chunks; the beef should be as fine as possible. Once the ground beef and the tomato paste begin to simmer, turn down the heat to low and cook for 30 minutes. Add a pinch of salt and pepper to the flour. Add some grated cheese to the breadcrumbs. Added parsley to the breadcrumbs (optional). Once all the rice balls are coated, place in the refrigerator for 15 minutes while you get the fryer ready. After 15 minutes, fry the rice balls in 3 inches of oil in a sauce pot (or fryer) at 350 degreesfor approximately 3-4 minutes until golden brown. Once they are done, place them on a cookie sheet lined with paper towels to absorb any extra oil. Sprinkle with some grated cheese. COOKS NOTE: If you don’t have a candy thermometer to test the temperature of the oil, just heat the oil and toss in some breadcrumbs. If they sizzle, you are ready. Don’t overcrowd the pan or the temperature will drop. 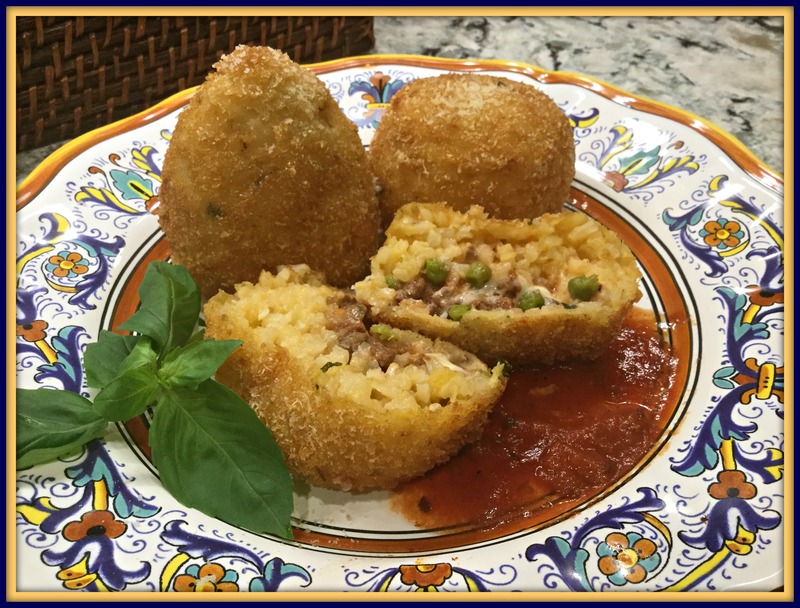 Have a great time cooking and enjoy your arancini! They are best served hot, but can be served at room temperature as well. 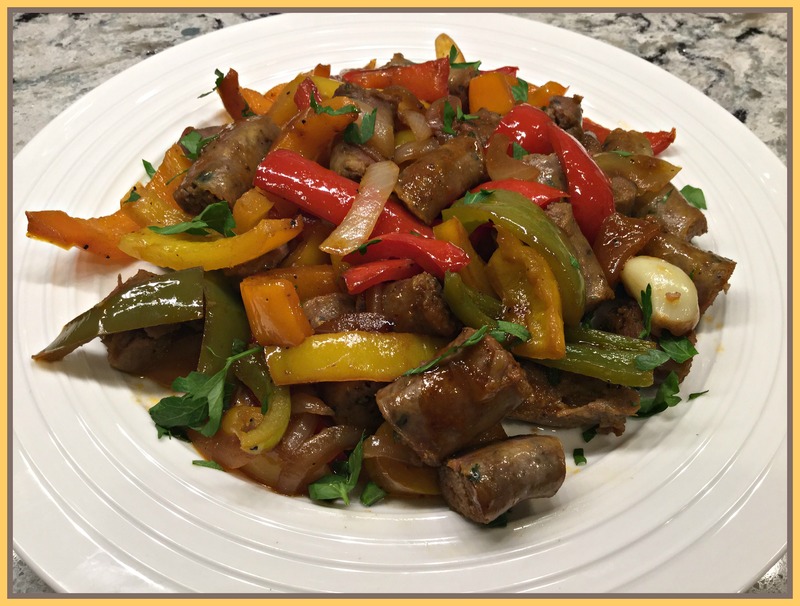 This is the basic recipe for sausage and peppers. At the Feast, you will get this piled high on a hero. Heat the oil in a large skillet over medium heat. Add the sausage ring and cook until light brown on both sides, about 8-10 minutes. Remove from the skillet and set aside. Make room in the center of the pan and add the tomato paste and stir for a few minutes to toast the tomato paste; then mix it well with the peppers and onions. Add the white wine, ½ cup chopped fresh basil or parsley. Stir to combine and scrape the bottom of the pan with a wooden spoon to release all the browned bits. Bring to a simmer. Cut the sausage into 1 inch piece and add the sausage back to the pan and stir to combine. Cook until the sauce thickens, about 20 minutes. Can be served in a bowl or on a toasted hero roll. Serve immediately. and until my next post, make every day a celebration! 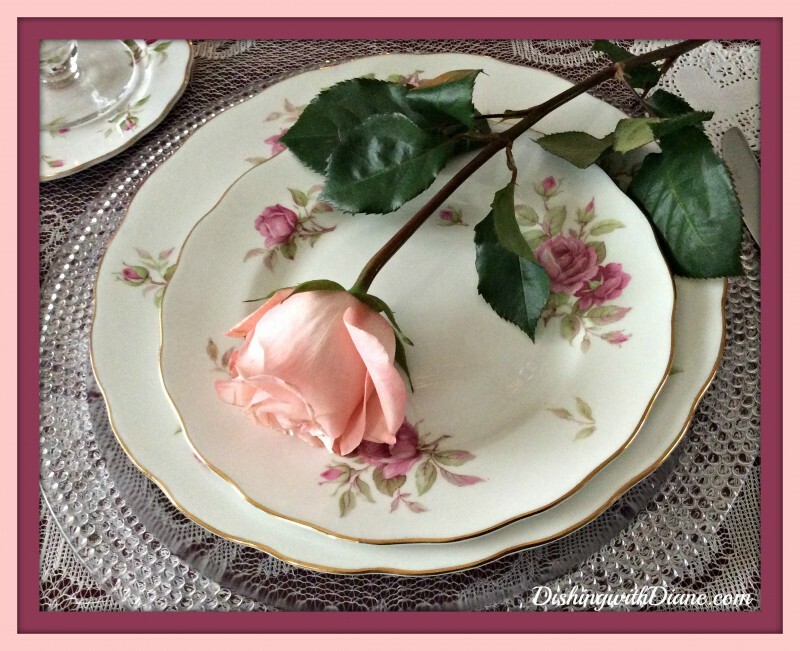 Please ask your family and friends to follow DishingwithDiane.com either on facebook or sign up for emails directly from the web page. And share this post with your family and friends. Note– You can add DishingwithDiane photos to your pinterest page; just hit the save button in the top left hand corner of the pictures. This entry was posted in Seasonal on September 19, 2016 by aries041158.